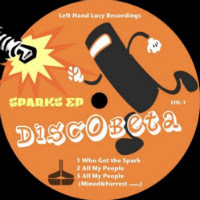 It’s been a while since the monkey has heard from production duo Discobeta but it looks like they’ve been keeping themselves busy and here’s the proof – their brand new Who Got The Sparks EP. Who got the sparks? Name sounds a bit like Black Moon’s Ronnie Laws-sampling ’93 Who Got The Props doesn’t it? As does the track itself come to that since all three cuts on the EP find Discobeta are essentially reworks of Buckshot, Evil Dee and 5Ft’s track. But while opener Who Got The Spark is a beefed-up remix of the Black Moon original containing the original vocals, All My People is effectively an instro version of the original now featuring only a simple hook – To all my people in the back yo wassup?/ To all my people in the front yo, what’s good?. Which just leaves Mined & Forrest time to beef that up. Cue the video which features everything from the Flintstone bird beak record stylus, to everyone from Batman to Buck Rogers having a boogie. 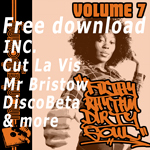 Oh did I mention the Discobeta version is a free download until it gets officially released? Click on the Soundcloud player below, then click ‘More’.